Russian Foreign Minister Sergey Lavrov meets with US Secretary of State John Kerry. In a recent phone call, Russian Foreign Minister Sergei Lavrov and U.S. Secretary of State John Kerry agreed to hold the next meeting of the International Syria Support Group in Munich on February 11, the Russian Foreign Ministry reported on Feb. 4. "The sides confirmed the agreement to hold the next ministerial meeting of the International Syria Support Group in Munich on February 11. All aspects of the Syrian settlement process in compliance with UNSC (UN Security Council) Resolution 2254 are expected to be discussed during it," the ministry said in a report published on its website. "Lavrov and Kerry stated the need for urgent steps to be taken both by the government of the Syrian Arab Republic and the opposition in order to ensure humanitarian access under UN auspices to the country's districts besieged both by government forces and units of the armed opposition," it said. "In this context, the foreign ministers of Russia and the U.S. agreed to coordinate possible measures to deliver humanitarian aid to the appropriate districts of Syria by air, using military-transport aircraft," the Russian ministry said. 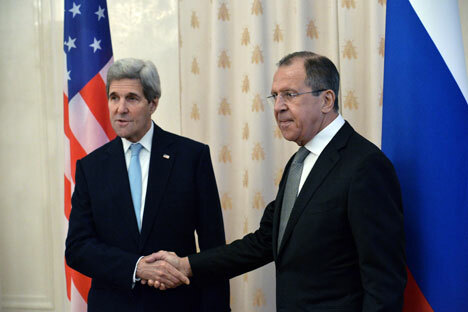 Lavrov and Kerry shared their regret about a pause in the intra-Syrian negotiations in Geneva. "Expressing their common regret about the fact that a temporary pause has been taken in the intra-Syrian dialogue, which started several days ago in Geneva, under the UN aegis, Sergei Lavrov and John Kerry agreed to make the necessary efforts so that this pause should be as short as possible," the ministry said. Lavrov said Russia was concerned about the fact that "some Syrian opposition members have put forward unacceptable preconditions for arranging a sustainable negotiating process with the Syrian government," it said. Moscow also called on the U.S. and its allies to remain committed to the provisions of UN Security Council Resolution 2254.